Def Leppard and KISS played show four of their Summer Tour 2014 last night in Auburn, WA and here are the setlist statistics. 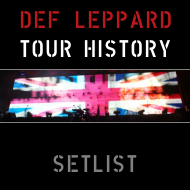 The show took place at White River Amphitheatre with 14 full songs played by Lep. View all the stats below after four shows. 14 full songs played and one snippet. Once again no major changes in the setlist although Vivian did say in a pre tour interview they had a couple of songs planned for rotation. 'Rock! Rock!' having been rehearsed according to Phil. All 14 of these songs were played at the last Auburn show in September 2011. Of course 'Rocket' was the extended version on the Mirrorball tour.